PVC cable materials Compounding & Pelletizing Line is double stage pelletizing machine. The first stage uses high speed co-rotating parallel twin screw extruder and the second stage is single screw extruder. This combination is because of the characteristics of high speed, strong compounding twin screw and low speed, low temperature, low shear single screw. This line enhances advantage and avoids disadvantage, which is the preferred choice for heat and shear sensitivity of materials compounding modification. 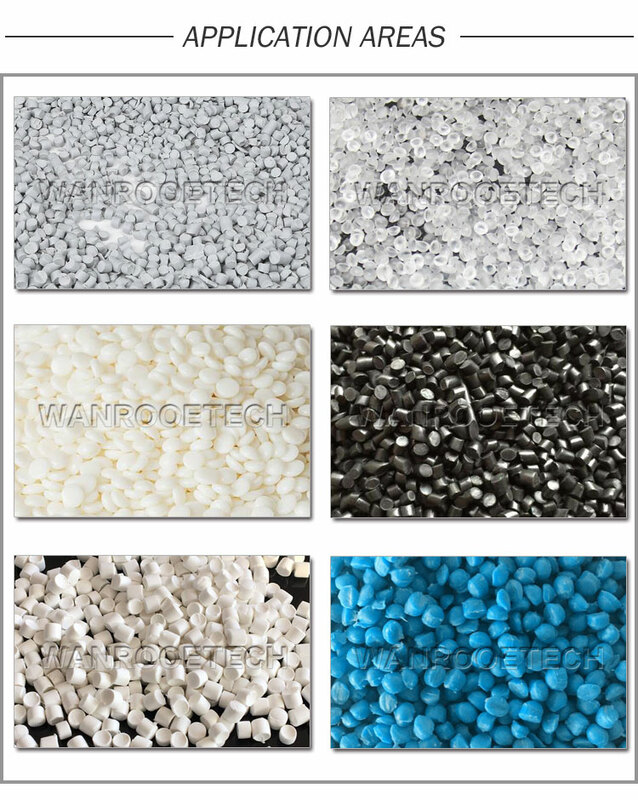 It is suitable for granulation of PVC cable material,s hoe sole material, transparent bottle material, PE/EVA carbon black masterbatch and other crosslinked cable materials. This equipment has admirable compounding effect and easy temperature control. It is of excellent safety and simple operation. The screw is made of high tool steel 38 CrMoALA or W6Mo5Cr4V2. Special screw combination Euro-style rectangle barrel, reflux refrigeration channel optimized and disposed, which makes temperature difference in D areas smaller. Innovated design of heater-tightened style insures high efficiency of heat transfer and high longevity of heater. The material is used high quality nitride steel, corrosion proof or antifriction with corresponding processed special designed two sets of vacuum. The selected material of drive components is dainty, including super intention alloy, cementiteing steel, cementiting and grinding. 1. Screw feeder: the first step of the pelletizing recycling machine, Pvc plastic flakes/scraps conveyed into the hopper through screw, the screw connect sensor to detect the material in hopper, once the flakes are full in hopper, the screw will stop; and once empty, the screw feeder will begin working. 4. Cutting pelletizing: supplied with speed steel and hard alloy steel cutting blades for reliable performance. Compact structure allows less maintenance. Stable running, higher output and lower energy consumption.